Seventeen years ago, U.S. 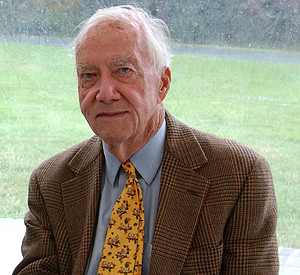 Senator Charles Mathias was retiring from Congress after eight years in the House of Representatives and eighteen years in the Senate demonstrating courageous personal efforts to further civil rights and begin the Chesapeake Bay cleanup effort. At eighty-two years of age, his legs are weaker and he suffers some infirmities, but his personal vision is as clear as ever, and don't be surprised if tears seem to well up at the corners of his eyes as he recalls being a child living in the Thurmont area and playing in the streams. It was that love of nature and experience of clean water that led him those many years later to look to do something to help the Bay. 1970 saw the creation of the Environmental Protection Agency (EPA) and the first Earth Day celebration. The initial Clean Water Act was only a year old. A first-term U.S. senator from Maryland, he was increasingly hearing reports about something amiss in his own backyard. People on and near the Chesapeake had a host of complaints: seafood harvests were down, grass beds were disappearing, raw sewage and industrial wastes were pouring into the water. He went to see for himself. He left the Port of Baltimore on a five-day, 450-mile tour of the Chesapeake Bay. Then-EPA Administrator Russell Train was along for part of the trip, as was Interior Secretary Rogers Morton. Mathias talked to more than 150 people, from businessmen to government officials to watermen to farmers to scientists. Ultimately, the EPA got $25 million for a five-year study. It's final analysis, in 1983, led to the formation of the state-federal Chesapeake Bay Program partnership. Mathias was also a drafter of many key civil rights laws, and proud of his role. "Segregation was not just a legal theory," Mathias said. "It was a fact. Our whole society was organized to enforce segregation. This was a way of life, [but] it's hard to believe it. I can remember education under separate but equal. And I can tell you it was separate, but it wasn't equal." To know about Charles Mathias is to recognize character as counting for something precious and affirming in society. In an age and place lacking comity and class, it would serve us well to recall a public servant who accomplished changes that led to great public goods. And for us to know that he was from Frederick County, a Republican, an environmentalist, and stood as a liberal within his party, which is rare indeed today. I had an opportunity to meet him last year, and I clasped his hand and thanked him for all that he had done. We can only hope to see his like again. A Note of Special Thanks to the Bay Journal for the quotations of Mathias from an article, and for being a rare publication that gives its information as free and public material, much in the spirit of the internet and environmental community!